In most surveys I have seen, there is a positive linear relationship between CMR/U5MR and acute malnutrition. Also, the report www.tulane.edu/~internut/GAM-mortality_text_19_Dec.doc. However, I've faced a dilemma how to interpret a survey in Asia with the very low levels of U5MR (< 0.2) for GAM rate exceeding the emergency threshold. Can someone provide me guidance or any useful documents/links so that I can be able to come-up with plausible explanation as to why there are consistently low levels of mortality in surveys with very high levels of GAM. This could be do do with how you estimate GAM. When the association between simple anthropometric indicators and mortality has been investigated in cohort studies, the association between W/H and mortality has been found to be weaker than for any other indicator (i.e. MUAC, W/A, H/A are all better than W/H in this regard). The issue is further complicated by W/H being strongly influenced by body shape. If you have a population that tend to short trunks / long legs then you will probably see high GAM (by WHZ) but low mortality. Do you have MUAC data? What is the prevalence of GAM by MUAC (i.e. MUAC < 125 mm or oedema)? Is it much lower than GAM by WHZ? Does GAM by WHZ increase with increasing age? These suggest a body shape issue with W/H in your population. would require time to flow in reverse. One thing to consider is that the relationship between malnutrition and mortality is not a fixed relationship. Most deaths among malnourished people are attributable to disease/infection rather than simply a lack of nutrients. A major factor in the association is the amount of exposure to infection the malnourished people face. In relatively sterile, arid locations, with a dispersed population you would likely have a much lower rate of death than somewhere like a refugee camp in a jungle. Malnutrition makes people vulnerable to infection (and therefore to death), so the higher their exposure, the more likely they will be to contract some infection their bodies would have difficulty in fending off because of their poor nutritional status. If you find a high GAM, but low mortality, it could be due to a number of factors like low exposure to infection; a very recent, rapid rise in malnutrition (like Mark was saying); or even good access to medical care to treat infections as they arise like we saw in the Balkans. I once saw a nutrition survey that was done right after a diarrheal epidemic. Because mortality had been low in the 90 days leading up to the survey, the results showed a low mortality rate. But there hadn't been time for catch-up growth and weight gain among the children so GAM was high. In eastern DRC, where the infection load was very high, people were surprised and questioned the results of mortality surveys because they were so high in relation to GAM when compared to Darfur in the '80s. Multiple mortality surveys from multiple agencies gave very similar results, so I do think they were credible and reflecting the toll of the higher disease load on a malnourished population (as well as a protein-poor cassava-based diet). Not an easy question ... major complications are (1) the mortality estimate is (usually) for the period before the GAM estimate, (2) the analysis is ecological (i.e. we are not looking at the risk of death in wasted individuals but the correlation between a previous mortality rate and a current GAM prevalence in a population), (3) W/H may only be weakly associated with mortality so GAM by W/H mat be weakly correlated with mortality, (4) You're not really sure what the mortality rate is telling you. The method cannot distinguish between rising and falling mortality. A situation of HIGH GAM with LOW MORTALITY could be as simple as "lots of death coming quite soon" or may be due to a survivor bias (common when you do mortality and anthropometry in the same sample). The reverse situation might be as simple "all the wasted have already died". It must be noted that a typical mortality survey reports on what has happened on average in the past not not what is happening now. BTW ... high "GAM" in Darfur might be due in large part to the use of the biased W/H indicator. I'm immensely thankful for your replies. Mark, the prevalence of GAM by MUAC (<125 and/or oedema) is much less than the W/H estimates (7%by MUAC for 18% by W/H), but as it stands the 'body shape issue' would not be enough justification for donors and cluster partners to convince them why there is a low mortality rate while the GAM with W/H is exceeding the emergency threshold. SMART is the nationally endorsed method for assessment, so it would be difficult for me to suggest the mortality results obtained with this method is misleading. I would very much go in to details on the three points you've riased. (1) the mortality estimate is (usually) for the period before the GAM estimate, (2) the analysis is ecological (3) W/H may only be weakly associated with mortality. So, how can i further elaborate these points with justifiable reference documents. Also, I appreciate if you could further explain the mortality plots or direct me to a link so that i can read more. Merry, i fully agree the low mortality might be the low exposure to infection, but the prevalence of illness in these surveys is very high. Also, i doubt it's due to a very recent, rapid rise in malnutrition because the trend in the results in the past 18 months in the same season were some how similar (21%, 19, 18), but mortality is still the same (very low). That was the main question, why? Kindly pardon me to go in to this in details, but to come-up with plausible explanation is challenging for me and that's why i try to get as much information as possible. Thank you again for the useful information and please don't hesitate to share any additional information or articles in this. What is the prevalence of SAM? Is there therapeutic feeding program (OTP +SC) in the area? Now days, OTP is being implemented through integrating within the health system. In such setup (addressing only SAM), it is possible to see high GAM rate because the treatment for majority of malnourished children, MAM, is not address. However, due the attribution of OTP, the prevalence of SAM could be low. Studies shown that severely malnourished children are 9 times more likely to die from infectious than healthy children. In this case, the result you found low U5MR could be due to the contribution of OTP. If morbidity is high, then you are probably right, that the difference is probably not due to low infection rates. While GAM based on W/H is affected by body shape, it would be unlikely to have such a profound impact unless you were in the midst of the Dinka in South Sudan. Can you tell us exactly what your U5MR, SAM and GAM rates are? That might be helpful. Also, do you have data from previous surveys you could compare to in order to see if this is a trend in the area? One thing to consider is that the mortality rates may be inacurate and underestimating the true mortality rate. How were the mortality estimates obtained? These are notoriously difficult to get right. In some societies, families are very reluctant to admit to deaths, especially of very young children, resulting in under-reporting of mortality. I would suggest you look at the ages and genders of the deaths that have been recorded, if you have that information. Are they grouped? Are there gaps? Does it show more children >36 months than younger? You could also compare the ages of those who died and those reported to have higher levels of infections at clinics. How do they correlate? Does the correlation make sense? Finally, your best bet is probably to go back to some of the communities and see if there have been recent events, like an epidemic of diarrhea or flu just before the nutrition/mortality survey. This might cause a sudden temporary spike in malnutrition but may not result in deaths. Since mothers often don't take their children to hospital for diarrhea or other mild illnesses, this might not show up in clinic data. I missed the bottom of your last note and just saw it where you explained several things I was asking about. So you have do previous surveys that show a similar result of very low U5MR and pretty high GAM. Can you remind me what your SAM is? As it stands right now, my best guess is that the problem is likely to be with the way something is being measured. Most likely mortality. You might want to review how that is being done. Also, can you tell us a little bit about the location? Where is it and what group of people you are working with? Are they pastoralists? Do they drink a lot of milk? Sorry I can't be of more help than that. Thank you very much for giving me so much insightful and useful information. I have enough information now and I fully understand where to begin to assess all the points you mentioned one-by-one and try to understand the situation. God bless you Merry. Dear anonymous, thank you for your information as well and I will also look in to the interventions going on. Sorry for the delay. I've been in the field. "So, how can I further elaborate these points with justifiable reference documents." (1) Mortality estimate is for period prior to the GAM estimate - This is just a fact. (2) Ecological analysis - The term "ecological" means that the relation is between population estimates rather than individual characteristics. Ecological analyses are difficult thing. Births rates and stork numbers are stongly associated with each other but do storks really deliver babies (this article might help). (3) W/H and mortality - This article is a review. The reference list may be useful. "Also, I appreciate if you could further explain the mortality plots or direct me to a link so that i can read more." The plots are illustrative. 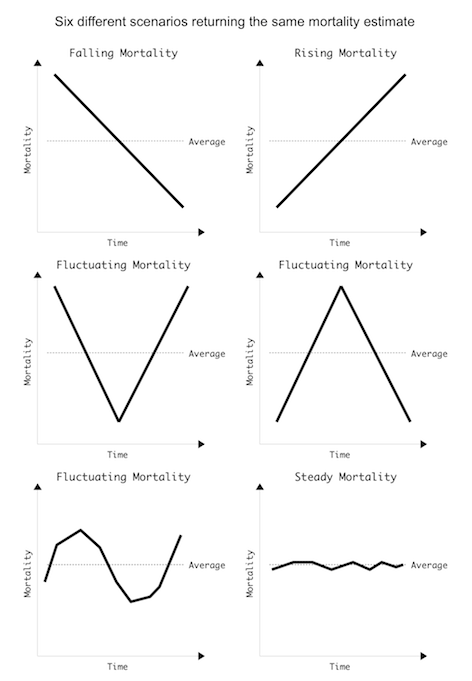 If you attach the same axes to each then a retrospective mortality survey over the period shown on each graph will yield the same mortality estimate even though mortality has been different over the recall period. This is a weakness of the simple retrospective approach. There are many others around bias.